Sole Dore is a seafood dish named after a village in Sheffield, England, and is a wonderful way to enjoy the delicate flavor of sole. This fish is a good choice for a quick dinner, because the fillets are thin and flaky, and don't take more than a few minutes to cook. Sole can be substituted with other, similar kinds of fish such as flounder, and even heavier fish like grouper, haddock or halibut, depending on availability in your area. You may want to adjust cooking times accordingly; the less flaky the fish, the longer it will take to cook. 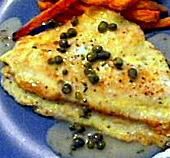 The sole is sautéed in butter after a light egg batter, and finished with an easy lemon caper sauce. Rinse the sole fillets and pat dry with paper towels. Season the fillets on both sides with salt and fresh ground black pepper to taste. Put the flour in a separate, shallow dish or bowl, and place next to the bowl with the beaten eggs. Dredge the fish fillets, one at a time, in the flour to coat both sides, and then transfer into the dish of eggs. Turn the sole fillets in the egg to coat both sides, and leave in the egg. Take care handling the fillets, as they'll fall apart easily if they become too soggy. Once all the sole fillets are floured and transferred into the dish of eggs, place in the refrigerator until needed. In a large non-stick skillet, melt the butter over medium to llow heat, until it begins to sizzle slightly. Lift the sole fillets out of the egg mixture, allowing the excess to drip off, and sauté for 2-3 minutes per side until golden brown. Cook in batches if necessary, and keep warm in a very low oven. When all the sole fillets are cooked, turn off the heat, and add the capers, lemon juice, parsley, and cold butter to the pan. This will be your lemon caper sauce. Whisk the ingredients briskly until the butter melts. Taste for salt and pepper, and adjust. Place the sole on four warm plates, and spoon over the lemon caper sauce. Serve with lemon wedges and garnish with parsley.